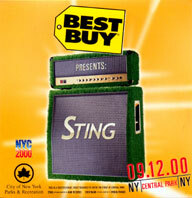 On 12th September 2000, Sting plays a special concert in Central Park in New York, promoted by Best Buy CD stores. Tickets to the concerts can be win in the Best Buy shop. To that, they give this CD.